Promoter Srl is an SME based in region of Pisa. It brings together competencies and experiences in the areas of information and communication technologies, multimedia innovation, business promotion and project management. Promoter operates in several fields, including technical development of ICT platforms and web-design, multimedia production, dissemination/marketing strategy, electronic and web publishing, corporate consulting, dedicated online services for the promotion of culture and tourism. Promoter features solid and longstanding experience in the management of EU projects, with particular regard to networking and communication activities, having been involved in many initiatives since the early 1990s. 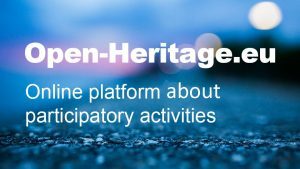 In the domain of e-infrastructures, digital cultural heritage and social science and humanities, Promoter has contributed as partner of the following projects: LINKED HERITAGE (CIP BPN), DCH-RP (FP7), EUROPEANA PHOTOGRAPHY (CIP Pilot B), HARMOSEARCH (FP7-SME), CIVIC EPISTEMOLOGIES (FP7, INFRASTRUCTURE), EAGLE (CIP BPN), RICHES (FP7 SSH), EUROPEANA SPACE (CIP BPN), PREFORMA (FP7 PCP), HOLA CLOUD (H2020, ICT). In 2011, Promoter launched digitalmeetsculture.net, the platform addressed both to professionals and general public: to members of the arts and cultural heritage sectors interested in digitisation processes and digital technologies (e.g. museums and libraries managers, curators, digital archivists), those interested in the creative uses of the digital art (e.g. artists, photographers, performers, art critics, arts researchers), members of the educational sector (e.g. teachers, students, vocational trainers) and also general users wishing to be informed and up-to-date on these matters. Digitalmeetsculture.net is an online magazine that provides information, resources and articles about the encounter of digital technologies with the cultural heritage and the arts. The portal is constantly growing and it receives c 25,000 visitors per month, it counts c 700 registered users and has a mailing list of more than 7,000 users who receive its newsletters. Antonella Fresa – female - ICT expert, Director of Design and General Manager at Promoter SRL, she has been working on European cooperation projects since the nineties. Since 2002, she is Technical Coordinator and Communication Manager of national and European projects in the domains of digital cultural heritage, creativity and co-creation, citizen science, smart cities, digital preservation and eInfrastructures. From 2002 to 2012, she has been advisor of the Italian Ministry of Cultural Heritage and Activities, technical coordinator of the Ministry’s EC funded projects on digitisation, and from its establishment until 2012 Member of the Concertation Table between the Ministry of Culture (MiBAC) and the Ministry of Research (MIUR). From 1999 to 2002, she was Project Officer by the European Commission in Brussels. Previously, adviser of innovation agencies, Italian and European enterprises, universities and research centres. From 1980 until 1989 researcher at Olivetti in Pisa, Ivrea and Cupertino (CA, USA). She has been reviewer in the Call for the Portuguese National Roadmap of Research Infrastructures of Strategic Relevance (FCT, Portugal) and for the Austrian Agency for International Cooperation in Education and Research (OeAD-GmbH). She regularly serves as independent expert and evaluator for the European Commission. She is Vice-President of the PHOTOCONSORTIUM International Association for valuing photographic heritage and she is enterprise fellow at Coventry University. Founding member of IDEA - International Digital Epigraphy Association.